Someway or another, they’ve seen these cast iron bells being swung about in a TV commercial and for whatever reason the image has stuck. The kettlebell swing is a brilliant move. Usually associated with conditioning and fat loss, but rarely appreciated as the supreme posterior chain exercise it is. The truth is this: The kettlebell swing is one of the best examples we have of a ‘compound exercise’. Why do people not really know of the swing as a posterior chain exercise and a deadlift accessory move then? It’s all down to what muscles become the ‘prime movers’; the engine. The next time you witness somebody performing a supposed ‘kettlebell swing’, have a subtle look at their knees – are they bending at the knees more than the hips? Chances are 9 out of 10 people are. It’s so common. I was guilty too. Using the quadriceps as the engine instead of the hips. The kettlebell swing is a hip dominant move, the squat is a quad dominant move. How NOT to do a kettlebell swing. This is a SQUAT. We want more flexion at the hip and less at the knee. A correct kettlebell swing uses the stretch reflex of the hamstrings almost identically to a Romanian deadlift. One could argue a Romanian deadlift possesses a larger range of motion (depending on hamstring flexibility) than the swing; but in essence the mechanics are very similar. 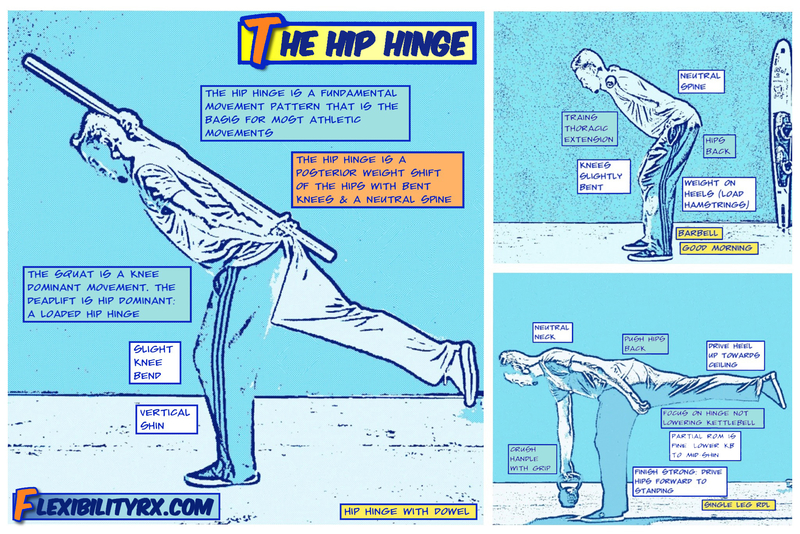 In the image below (courtesy of flexibilityrx.com) you can see a wonderful overview of the properties of a hip hinge. Notice the knees remain in the same position? IT’S NOT ALL ABOUT THE QAUDS, YOU KNOW! Stand beside a mirror if you can and take a hip width, or slightly wider, stance. Forget about using a kettlebell for a moment and assume a slight bend at the knee – this knee bend will remain constant and will not change. From here, hinge forward at the hips while keeping an extended spine (particularly at the thoracic region). 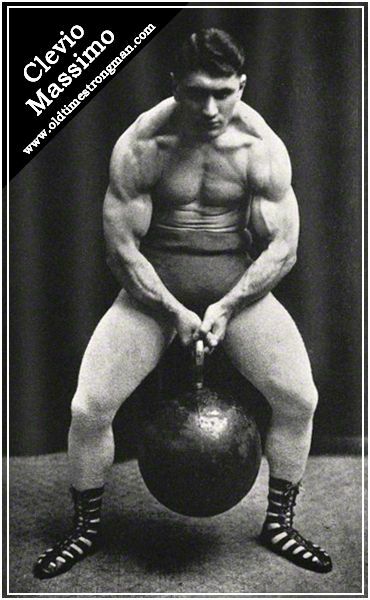 As you do this, take your hands between your legs as if you had your kettlebell. Try and hinge forwards as far as your hamstring flexibility allows; you should feel a stretch in your hamstrings. Once you find this point, simply reverse the movement by extending your hips, contract your glutes and lift your arms to eye level. Try this in a slow and deliberate fashion and as you acquaint yourself with this hip hinge minus the knee flexion, you can then start speeding things up. If you manage this, you’ll experience what many chase: chronic significant soreness in the posterior chain – but mainly the hamstrings. As usual though, delayed onset muscle soreness subsides as you consistently perform a movement. What does the kettlebell swing have to do with the deadlift? I’ll do my best to spare the geeky technicalities here. The kettlebell swing teaches you to use the hamstrings and glutes to full effect. How many times have you deadlifted and only felt it in your lower back? Most people run around at the mercy of lower back pain while thinking they need more lower back work. “It must be really weak!”, said Shelley. The reality is altogether quite different: If anything our lower backs are over-worked due to other muscles’ lack of efficiency. There’s a good rule I have. It goes as follows…….if you can’t feel it, you can’t build it. Using the kettlebell swing as a hip dominant move will allow you to use your glutes and hamstrings in other exercises, which will help combat our chair loving society. You may even get some increased cardiovascular fitness too. And we all love cardio. Great read and good information! Kettlebell swings are one of my favourite exercises (both as a PT and personally) and you do a fantastic job of breaking down the movement for beginners. Thanks very much for your input! Exercises need to get the credit they deserve. The kettlebell is one of the best-forgotten exercises I love to use in my workout. For sure! Do you do any kettlebell exercises outside the basics?